This recipe makes a large batch (>10) of low FODMAP mini muffins, which taste really rich and oatey and are delicious warmed up before eating. They make a great high fibre low FODMAP breakfast treat. You can add any fillings you like, we had lots of dried fruit to use up! The wet mix can also be made up of either yoghurt, milk or a non-dairy alternative milks such as rice, hemp or nut milks like almond or macadamia. NOTE: Oat bran: 55g of oat bran is high in FODMAPs while 22g is low in FODMAPs. The portions in the recipe mean the muffins will still be low FODMAP. That is as long as you do not eat them all at once! Read more on oat bran and the confusion of the FODMAP content of oats in our article ‘Suitable foods on the low FODMAP diet and recent changes‘. *Dried Fruits: We suggest you double check the Monash Low FODMAP App for appropriate portion sizes of the dried fruit you wish to use and work out how much fruit you can add in to safely eat per portion size of muffin. For example 100g of raisins is clearly high in FODMAPs (fructans) but divided amongst 10 or more muffins that is 10g in each and 13g of raisins is low in the FODMAP fructans. This is an easy and really yummy recipe, give it a go and enjoy with a nice coffee one morning 🙂 ……. Dietitian authored articles on the FODMAP dietary treatment available here. 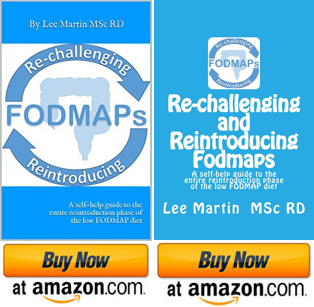 Find the Best Low FODMAP Resources, start here. Loving the look of these recipes, thank you! I’ve just started on the FODMAP diet and we’ve been wondering what we can cook for dinner / treats that are tasty! I noticed you used honey in these muffins, the booklet I’ve been given to follow puts honey as one of the ‘to avoid’ foods?? Hi there thanks for checking out the blog. Honey will be something you need to avoid if you have fructose malabsorption, if that is unknown however then you will need to avoid it just in case along with other foods and ingredients for the 8 weeks, which hopefully it mentions in your booklet. Obviously you can replace with sugar in the recipe. Best of luck with the rest of the FODMAP diet and I hope you enjoy the muffins; oatmeal / oatbran have been two new foods in our diet since starting the FODMAP diet and we really like them.